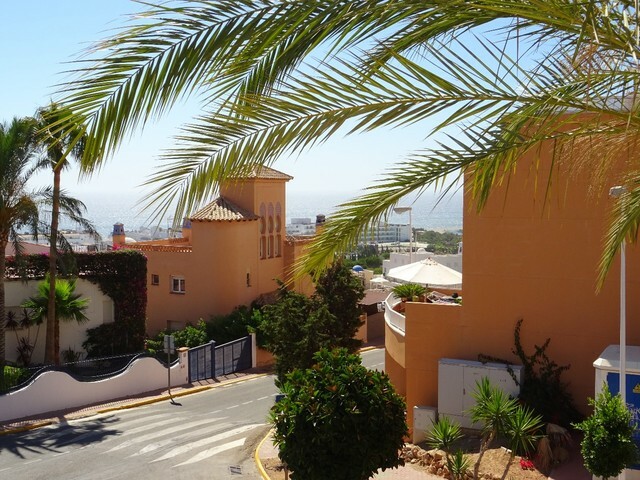 Sunny, east-facing apartment on the first floor of a small urbanisation with sea views for sale in Mojacar Playa, Almeria, Andalusia. This first line property is located on the first floor and has wonderful views over the wide, sandy beaches of Las Ventanicas, the Mediterranean sea and the promenade. The apartment comprises of 2 double bedrooms, a shower room, kitchen, lounge-diner and covered terrace. In total the built area of the property is 76m2. The covered terrace has been glassed in to make a conservatory (but this can easily be converted back into an open terrace). The shower room has recently been renovated as has the kitchen. The fitted kitchen is separate to the lounge-diner and has been renovated to incorporate the utility area at the end of the kitchen. There is access onto a small utility patio from the kitchen. There is AC (cold) in the bedrooms and ceiling fans in all the rooms. There is a communal swimming pool located at the back of the builiding. This property is ideal for holiday lets.